Just about SEVENTY TWO hours from now, the New York Jets will be taking the field in Detroit to start their 2018 season which is going to be very INTRIGUING. This season for the Jets is about BUILDING for the FUTURE, but IF all the pieces fall together in the RIGHT place. the Jets could SURPRISE some people this season and that starts with the most IMPORTANT position in the sport. Below is a THREE part preview of the Jets’ season before they start DISAPPOINTING me on Monday night. 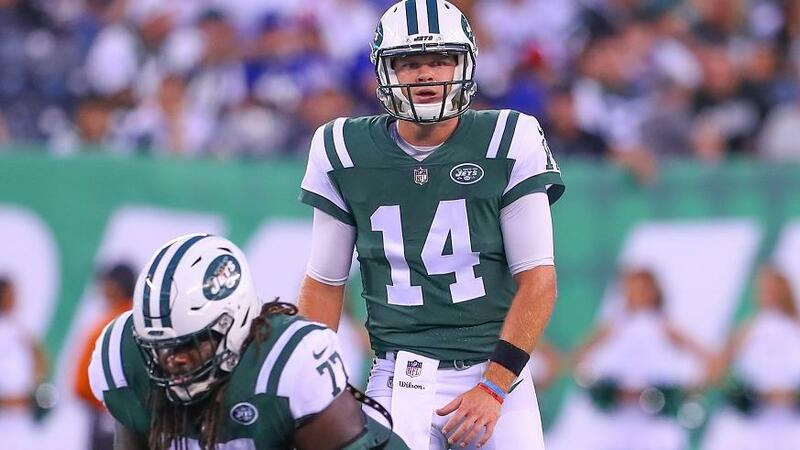 The Jets are going with a Rookie quarterback to start the season for the THIRD time in the last NINE years, that is NEVER a good thing, BUT all signs are pointing that they have FOUND their quarterback of the FUTURE in Sam Darnold. Sammy Touchdowns was the TOP pick for the Jets and he did MORE than enough in the preseason to be the Week 1 starter. Starting Sammy TD’s was a NO BRAINER, but it could ALL go SOUTH for the Jets if he is NOT ready to start the season. The Jets were NEVER going to make the playoffs this season with a VETERAN like Josh McCown, there is a MUCH higher UPSIDE with Sammy TD’s and that is why he is the starter. I expect Sammy Touchdowns to FLOURISH this season, but EXPECTING him to be GREAT in his age TWENTY ONE season is just UNREALISTIC, he is going to show FLASHES of GREATNESS this season, but he is NOT a COMPLETE package yet. The OTHER weapons around Sammy TD’s are GOOD but NOT great. In the running game, the Jets are going with Bilal Powell and Isiah Crowell, who are DECENT bench running backs but they are NOT going to provide the ELITE running game that can HELP a rookie quarterback QUICKLY adjust to the NFL pace. The running game NEEDS to get some BIG runs on FIRST downs and NOT put the team in a THROW ONLY situation on THIRD downs. The receiving core is NOT bad and Sammy TD’s should have some TD’s to his receivers. Jermaine Kearse is a SAVVY Veteran option for Darnold and guys like Robby Anderson, Quincy Enunwa, and Jordan Leggett are YOUNG like Darnold BUT do have a HIGH upside. The Offense by NO means of stretch is ELITE, but IF everything goes RIGHT for them, they can be in TOP half of the NFL offenses, but that is asking A LOT for a team that has a TON of players in KEY positions UNDER the age of TWENTY FIVE. The Jets Defense has a chance to be ELITE because there are A LOT of GOOD players on the defensive side of the ball. Leonard Williams has proved himself to be ONE of the best YOUNG defensive lineman in the game and this might be his BREAKOUT year. He is GREAT at stopping the run and the Jets NEED him to play like one of the ELITE defensive lineman in football IF they want to make the playoffs this season. The linebackers are the ONLY question mark on the defense. Darron Lee was a FIRST round pick THREE years ago, but he has NEVER played like it. He needs to step UP his game this season and DOMINATE in the middle of the field. The Jets are starting some YOUNG guys at the linebacking position and that MIGHT be at the TOP of things that COULD go WRONG for the Jets this season. The BEST unit on the Jets is the secondary, where they could have MULTIPLE Pro Bowl CALIBER players. Offseason ACQUISITION of Tru Johnson at the cornerback position is going to help the TWO best YOUNG safeties in the NFL in Jamaal Adams and Marcus Maye. The FOUR listed starters in the secondary: Jamaal Adams, Marcus Maye, Mo Claiborne, and Tru Johnson are ALL pretty YOUNG and HIGH upsides so they could ANCHOR this team to the PROMISED land. The Special Teams was NOT bad last season and they got a NEW kicker Jason Myers. The offense is NOT going to score a TON of points this season so the special teams unit is one of the MOST important units on the team, they CANNOT afford to make MISTAKES and cause BAD field positioning. OVERALL for the Jets, this season is going to be a TON of growing pains and Wins and Losses do NOT matter as much as seeing the YOUNG players play and DEVELOP into GOOD NFL players. In the preseason previews, I said that the Jets would go 6-10 this season, I am sticking with that prediction because they have a HIGH upside this season, but EVERYTHING could also FALL APART if the YOUNG players are NOT ready to become GOOD NFL players. EVERY year I call the Jets DEAD before the START of the season, I am NOT going to do that this season because I want to see how everything plays out and then DECLARE them dead. I will be recapping EVERY Jets game this season, so come back here after Jets’ games to get my INSTANT reaction on our BELOVED New York Jets.